Our new Podcast Room is now open at Park OffiCenter! Stop in and check out our brand-new soundproofed recording room that features the latest version of Adobe Audition, the industry leader in audio recording software, as well as a professional-grade microphone and headphones for you to record podcasts, commercials, or whatever you might need. 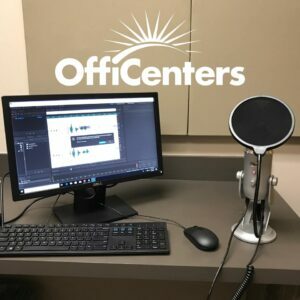 Featuring easy-to-follow instructions for your first recording, this setup is a great resource for those who want to grow their business, big or small! And, look for the Woodbury podcast room to be open later this month! Speak with any OffiCenters team member to make your reservation!